On cutting board, place 4 bread slices; spread each with 1/2 teaspoon mustard. Divide ham, cheese, and pickles onto bread. Spread 1/2 teaspoon mustard on one side of each of 4 more bread slices. Place bread, mustard side up, on sandwiches; divide turkey and tomatoes onto bread. Spread one side of remaining bread with remaining mustard and place, mustard side down, on top of sandwiches. In medium-size bowl, beat together eggs and milk. Into 9-inch square baking dish, pour half of egg mixture. Fit sandwiches into baking dish; pour remaining egg mixture over top. Set aside until sandwiches absorb all egg mixture, 15 to 20 minutes. Heat oven tot 300°F. In a large nonstick skillet, heat 1 teaspoon oil. add 2 sandwiches and fry until browned on both sides, adding remaining oil as needed. Transfer to a baking sheet and keep warm in oven. Repeat with remaining sandwiches. Allow sandwiches to stand in oven 5 minutes after last sandwiches have been place on baking sheet. 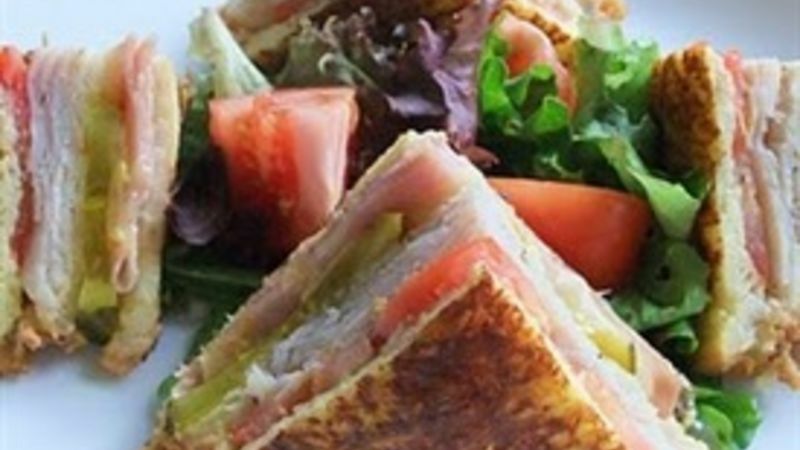 To serve, cut each sandwich diagonally in both directions to form 4 triangular quarters. Insert a toothpick through center of each quarter and set 4 quarters on each individual plate. If desire, place greens in center of sandwich quarters and pass prepared dressing.